When I think of excitement, I think funnels and filters! Okay, who am I kidding. They’re not the most exciting pieces of homebrewing equipment, they aren’t even considered a required pieces of equipment and aren’t included in most homebrew starter kits. However, they are pieces that could make things easier and tastier. 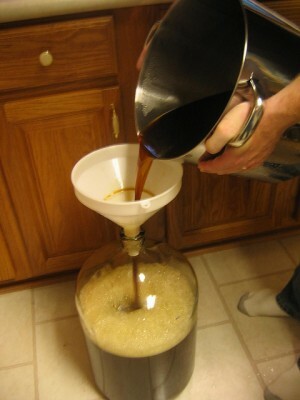 For the extract brewer, there’s really just one part of the brewing process that will require a funnel. It’s when you’re pouring your wort from your brew pot to your fermenter. If you’re using a glass carboy as your primary fermenter, you’re definitely going to need a funnel. I dare you to try pouring your fermenter into the narrow opening of a carboy without a funnel. Okay, I was just joking. I don’t really dare you because things could get very messy very quickly. If you’re not using a glass carboy as your primary and you’re using a plastic bucket, you still can use a funnel. Why? If you use a funnel that comes with a filter (or use a strainer you already have in the kitchen), it’s a great way to take out all of the ingredients that you don’t want sitting in the fermenter and making your way into the bucket. The hops and other large ingredients can add a lot of good flavors and aromas to your beer when you use them in the brew pot, however in the fermenter they can create off flavors that you don’t want. Also, straining the wort leads to clearer beer when it’s all said and done. I learned this the hard way when I used 90 ounces of pumpkin in my Halloween themed beer last year. It tasted great, but in some of the bottles there was remnants of the pumpkin. You can avoid this by making sure not to syphon the bottom inch or so of wort from your fermenting bucketing to your secondary fermenter or racking bucket. However, it’s a lot easier with there’s less debris to avoid at the bottom of the fermenter.